C/C++ programmable controller based on a 32-bit 100/133 MHz AMD. 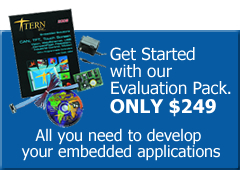 The 586-Engine (5E) is a C/C++ programmable controller based on a 32-bit 100/133 MHz AMD Elan SC520. The SC520 integrates an Am586 CPU and a high performance ANSI/IEEE 754 compliant 64-bit hardware floating point unit (FPU). It is designed for embedded systems that require high performance, PC-compatibility, compactness, and high reliability at a low cost. Two UARTs from the 386EX, 8 UARTs from 2 QUARTs (TL16C754B), plus one SCC2691 UART provides a total of 11 async. serial ports. All transmit and receive data lines plus handshaking signals (/RTS, and /CTS) are buffered with RS232 drivers. Three of these RS232 ports can be replaced with optional RS485 drivers. 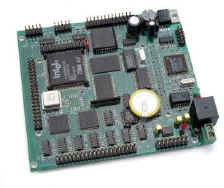 The 386EX processor has two internal UARTs, supporting reliable DMA-driven serial communication at up to 115,200 baud. The processor also has a sync. serial port operating at up to 8 MHz. Three 16-bit timers/counters can be used to count external events or generate pulse outputs. The two quad UARTs (TL16C754B, TI) provide a total of 8 high speed serial ports, with each port featuring 64-byte transmit and 64-byte receive FIFOs. These deep FIFOs can release processor load and guarantee reliable performance for multi-serial port high speed (up to 2 Mbps) communication. Programmable FIFO trigger level, software XON/XOFF, hardware flow control are supported. At a sizeable 6.1×4.5″, the high performance 386EX uses faster 16-bit ACTF Flash (256 KW) and battery-backed SRAM (256 KW). Other features popular on TERN controllers are also found on the SD (such as the 512-byte EEPROM, real-time clock, PPI for 24 digital I/Os). Other optional components include 11 channels of 12-bit ADC (TLC2543, 20KHz, 0-REF+), and two channels of 12-bit DACs (DAC7612, 0-4.096V). Six Modem control signals on each UART can also be used as general programmable TTL I/Os. A combined total of 70+ TTL I/O pins are available for user use from the PPI(82C55), i386EX internal multi-functional I/O, and QUART modem control lines. An Ethernet LAN controller (CS8900) can be installed to provide network connectivity. A RJ45 8-pin connector is used to connect to a 10-baseT Ethernet network. A software stack library will support network protocols like ARP, DHCP, UDP, ICMP, and of course TCP over the Ethernet network. An expansion port (J1) supports mass memory expansion with CompactFlash or PCMCIA. An optional switching regulator can be installed to reduce power consumption and heat. The switching regulator also supports power-off mode, allowing A-level power consumption. The SD can be powered by unregulated DC 9V to 30V(with switching regulator).